PRIMEdge is synonymous with keeping the perfect edge on your knives. Especially designed for meat processing or food preparation lines, these innovative tools restore and straighten your knife’s edge. The honing rod steels the blade while the alignment element balls straighten the cutting edge. Whether you use a short boning knife or a long butcher knife, PRIMEdge keeps your blade razor sharp. 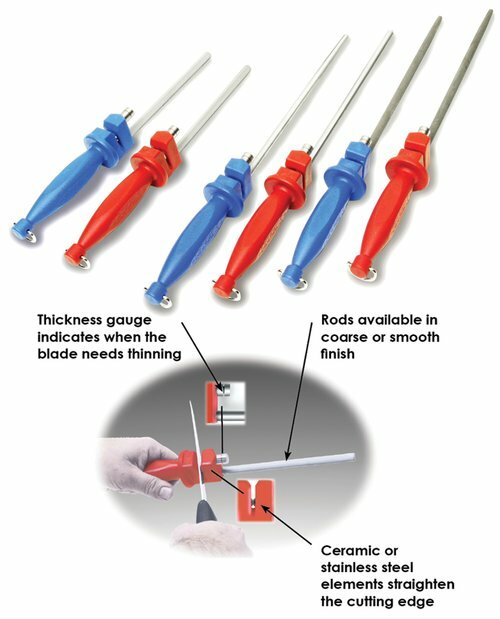 Eliminate your edge reconditioning problems with PRIMEdge knife maintenance tools. Rods available in coarse or smooth, short or long versions. Alignment elements available in ceramic or stainless steel. A few quick strokes will return your knife to peak performance. All-in-one design includes honing rod and alignment elements.